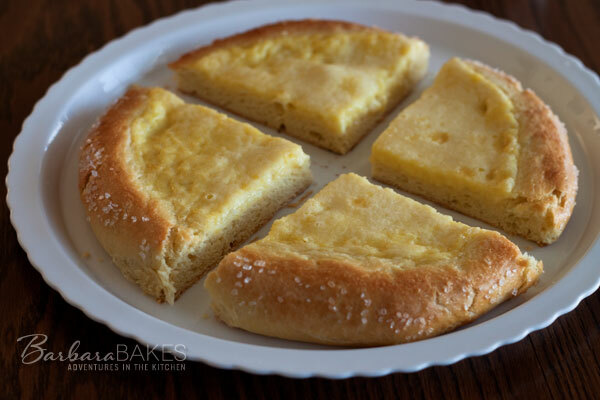 A buttery brioche dough sprinkled with coarse sugar and filled with a tart lemon custard filling. For the crème filling, mix the egg yolks, sugar, lemon zest and juice together in a large mixing bowl and gradually mix in the crème fraîche. Set aside. Preheat the oven to 180°C/360°F (or if your oven doesn’t have a 360 mark, you can do what I do and just stick it somewhere between the 350 and 375 marks). Divide the custard between the two rounds, filling them full. You may have just a bit of custard left over. No worries…eat that part with a spoon while you’re waiting.